Every Picture Tells A Story – AMPE, the (other) Dream Team & Raghuram Selvaraju | BuyersStrike! Today’s story begins with an aging office park, 500 arthritic Phase III subjects and a freezer that eats dreams. Welcome, dear readers, to the world of Ampio Pharmaceuticals (AMPE), the filthy reverse merger put together by Las-Vegas-based stock promoter Jens Dalsgaard, charming the market this week with tales from Freezergate ’14 (read more about Freezergate here). This morning, Ampio Pharmaceuticals announced a delay in the data analysis of the STEP study due to the fact that the study drug (both AmpionTM and the placebo) were exposed to lower temperatures than permitted by the drug specifications during shipment to the clinical sites….During the review of all documentation following the unblinding of the study, the company’s independent Clinical Research Organization discovered that the drug product received at the clinical sites had been below the temperature requirement of 15 degrees Celsius and may have been frozen for some period of time. Innocent enough? Hardly. All Ram is doing is regurgitating the company line, spinning what most certainly be failure into platitudes and excuses designed to keep suckers buying paper that likely is only worth the cash on the balance sheet, roughly $1.25 per share. But what really jumped out at us was a creative use of the plural (clinical sites?) and a funny definition of the word “independent”. We were recently in sunny SoCal and investigted this independent CRO, which just happened to share a wall with the study’s sole site and Principal Investigator (“PI”). Coincidence? If Ram had bothered to perform even the most basic of due dilligence, he would have been tracking the progress of the Ampion trial on the clinicaltrials.gov website. There he could have seen that there was only ONE clinical trial site, the office of Dr. Quang D. Vo in Anaheim, CA 92801. Isn’t that a red flag right there? Only one site and one doctor for a 500 patient Phase III trial should raise many alarms. What reputable journal would publish such drivel? This is not a small pilot study of 5 patients, where a single site is appropriate. This is a large randomized pivotal trial. Further, Ram could have also discovered the identity of the “independent Clinical Research Organization” that AMPE had hired. That CRO is named, in a delightfully ironic coincidence, Dream Team Clinical Research (remember stock promotion firm Dream Team Group?). 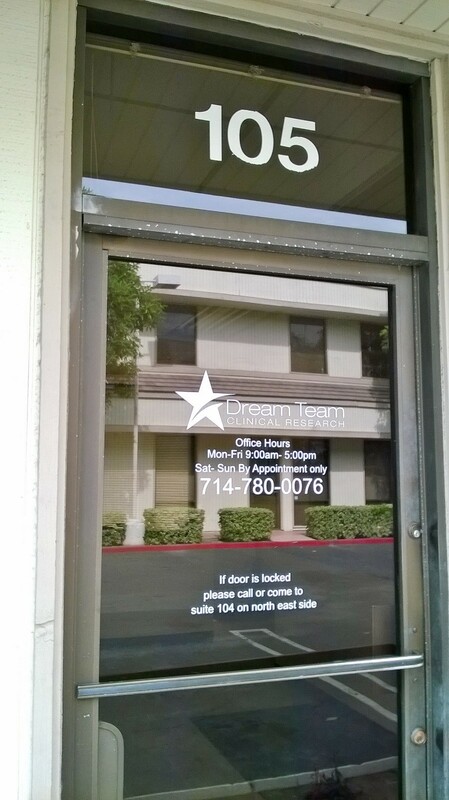 From the comfort of one’s own desk, or laptop, one could visit the website for Dream Team Clinical Research. This would take about ten seconds, and would raise an ENORMOUS red flag. Probably enough of a red flag to warrant a search on what other this wonderful outfit has been involved with, let alone managed. Go ahead, head over to clinicaltrials.gov, do a search on Dream Team Clinical and come on back. Being horrified at the lack of actual clinical trial management experience, the next step would be to make an in-person trip to the CRO offices and the clinical trial site. After all, that’s just what we did here at BuyersStrike!, a little detour to a Vietnamese neighborhood of strip malls and inexpensive apartments just off the highway in Anaheim, CA. 760 N. Euclid Street, Anaheim, CA. 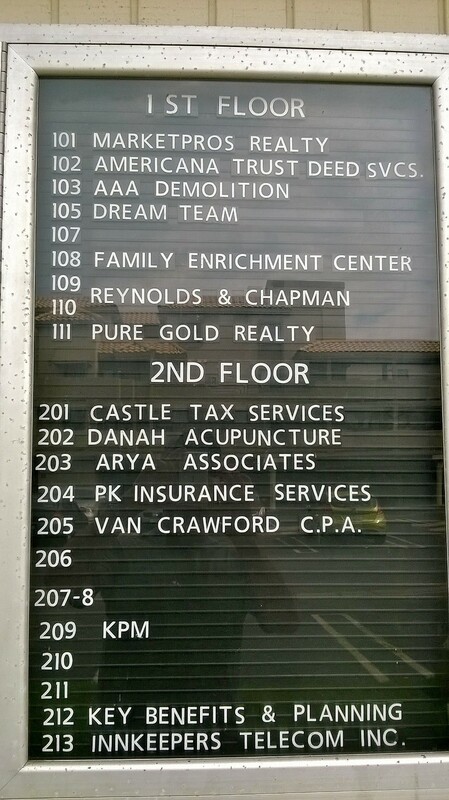 Home of DTC &…..
Notice Suite 104 is missing. OK, off to Suite 105 then. Can you make out the text on the bottom half of the door? As we were there on a weekend, the door was locked. 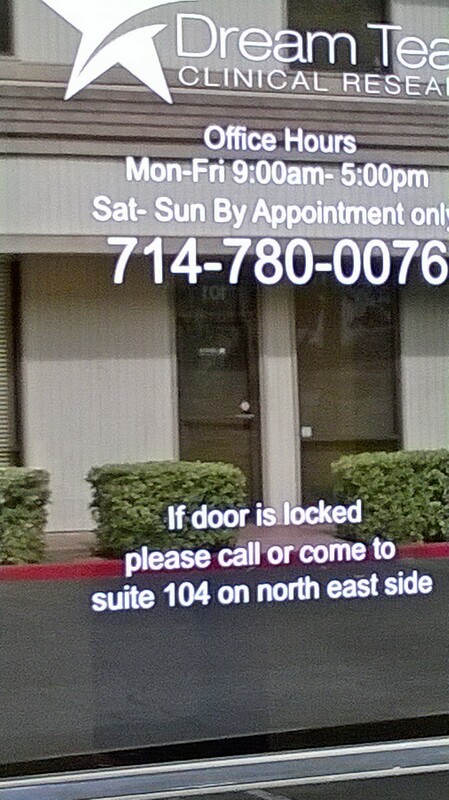 So we walked next door to Suite 104. Any guesses what we found? Look at that. 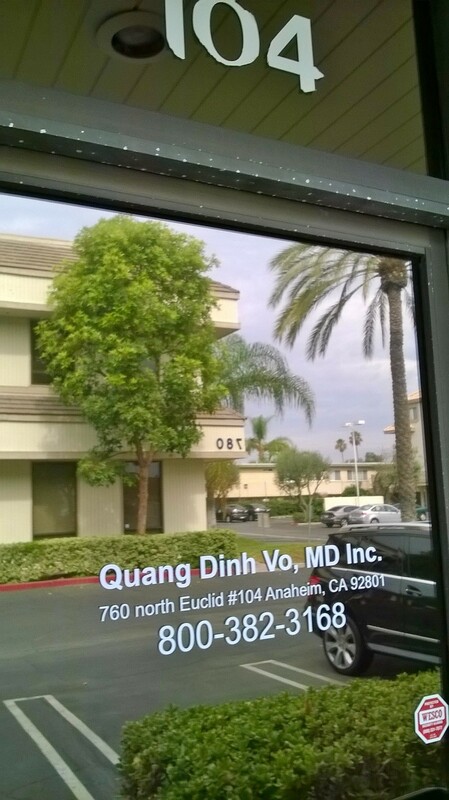 It’s the offices of Dr. Quang D. Vo, principal investigator of the AMPE study, and the only listed trial site. Right next door to the clearly world-class CRO hand picked by talented, reputable, AMPE management. Just how independent is this CRO? Clearly not independent of the only trial doc and trial site. What possible problems could there have been moving the drug from Suite 105 to Suite 104? And yet company management, and their sell-side shills like Raghuram Selvaraju want you to believe there were multiple sites, an independent CRO, etc. Do you still believe? Or is it more likely a pathetic ruse? Sell-side firms like Aegis would clearly rather shill for scummy reverse merger banking clients like Ampio than spend 10 minutes online to do basic research. Ram’s i-banking masters would rather pay for glitzy conferences to sucker dumb institutional money than pay for a ticket to LA and a rental car to visit the trial mill where the sausage is being made. Sad. Sadder still, that legitimate publications and news services like Bloomberg, and cable stations like CNBC, often quote sleazy operators like this as “experts”, as if they have opinions with any worth at all whatsoever. Speaking of institutional money, how is it that firms like Knoll Capital (the largest institutional investor in AMPE owning ~5.7% of the company), are even in business managing other people’s money given their clear incompetence? How could so-called professionals fail to perform such basic research. Certainly Fred or his daughter Karina Knoll know how to use a search engine, how to book a plane ticket and how to drive to Anaheim from LAX. If not, there is always GPS. Great DD! Appreciate you sharing. first of all: great investigation work. A couple of comments following. [@Paolo – Thank you. The link to the AMPE study was earlier in the piece, but you can find it here. Because AMPE changed the status of the study on 6 August, one needs to look through the changes to see Dream Team is the CRO, and the office next door is the only site. You can see all of the changes using clinicaltrials.gov. Be sure to uncheck the two “Hide” boxes. At BuyersStrike! HQ we go by the official Clinicaltrials.gov database for study information. If AMPE truly utilized more than one site, they should have reported it to the official database properly. So either they used only one site, or failed to properly report multiple sites (which would lead one to ask “What else is AMPE management failing to properly report?”). Either way it is very bad. The AMPE study is the only study found where Dream Team is running the show. In the other trials Dream Team is merely one of many sites and not the CRO responsible for managing the entire study. For example, in the Synergy Pharma (SGYP) plecanatide trial, Dream Team is one of 172 sites, all of which appear to be trial mills. In the Eli Lilly trial, Dream Team is one of 41 sites, and is not even recruiting yet. I think next week we’ll have more details but, again, I think that you jumped to partially wrong conclusions. Dream Team is just one of the locations (the only one listed by ClinicalTrials.org, indeed). We agree that there’s a problem of book keeping (and is more common than you might think) but if you can contact Michelle Cook, from DreamTeam, she will confirm they acted as one of the trial many locations. Not as CRO which I suspect may be PROMEDICA (which followed also the very successfull phase II trial: http://www.plosone.org/article/info%3Adoi%2F10.1371%2Fjournal.pone.0087910). Recruiting information dropped on cessation of enrollment. The problem is in moving the drug from the factory to the clinical site. But I think you’ve missed the point here. The study may have failed. The company may or may not be trying to delay releasing that news. That’s far more important to the value of this stock than other considerations (promotional/misleading management, the independence of the trial, etc.). It is a very informative analysis. Usually when some one writes an investigative article, the writer tries to get both sides of the story. Did you try to get any explanation from the company? Were you able to contact them or did they refuse to discuss with you? If you have included any response from the company in this analysis that would have added more weight and creditability and immensely helped the readers. I have lot of respect for people who go the extra mile to keep everyone honest and protect the individual investors from scammers. But we have to make sure that in our zeal to expose the corrupt, we should not become one of them. One way to avoid that, is to get both sides of the story. What if, the company had meaningful answers for the questions you have raised here, have we not punished the company by going public without giving a chance to defend themselves? If you have contacted the company management and have received any response, please update us. [@VT – As the saying goes “How do you know when company management are lying? Their lips are moving.” That is why here at BuyersStrike! we use the publically available database at Clinicaltrials.gov and follow up with in-person field work. Readers are encouraged to go to the supporting links and search through Clinicaltrials.gov themselves. Readers can also go to visit the building, etc. AMPE management (Macaluso, Clift, etc.) have been involved with another shady reverse merger in the past, Isolagen. It too had clinical trial issues. It is our opinion here at BuyersStrike! that reverse mergers are a red flag for fraud. If investors followed only one rule and merely avoided all reverse mergers they would avoid the vast majority of scams. sites involved and we only accounted for 28 of those randomized. As for the temp excursions, our IP was continually monitored and we had no such fluctuations. I am the CEO for Dream Team and everything you wrote regarding my site is false. Next time do your due diligence before posting false information. The CRO if acting as surrogate for the sponsor is responsible for upholding all of the sponsors obligations. a) A sponsor may transfer responsibility for any or all of the obligations set forth in this part to a contract research organization. Any such transfer shall be described in writing. If not all obligations are transferred, the writing is required to describe each of the obligations being assumed by the contract research organization. If all obligations are transferred, a general statement that all obligations have been transferred is acceptable. Any obligation not covered by the written description shall be deemed not to have been transferred. (b) A contract research organization that assumes any obligation of a sponsor shall comply with the specific regulations in this chapter applicable to this obligation and shall be subject to the same regulatory action as a sponsor for failure to comply with any obligation assumed under these regulations. Thus, all references to “sponsor” in this part apply to a contract research organization to the extent that it assumes one or more obligations of the sponsor. Sec. 312.53 Selecting investigators and monitors. (a)Selecting investigators. A sponsor shall select only investigators qualified by training and experience as appropriate experts to investigate the drug. (The CRO should have the addresses of any other sites besides its own. It should have the names of any investigators besides its own.It should personally conduct or supervise the investigations. It should monitor the IP for the whole study. Sec. 312.62 Investigator recordkeeping and record retention. Pingback: A Hazy Shade of Winter – Part 1 (TYME) | BuyersStrike!